Most digital creators know that adding subtitles is essential for modern social media videos. Nowadays, people watch videos while in transit, at work, in the bathroom, in the middle of the night, at the dinner table, and nearly everywhere else, so muted videos don’t reach most smartphone users. Since up to 85% of social media viewers watch videos with the sound off, videos that rely on audio or dialogue will be lost without captions. YouTube, Facebook, and other video platforms have subtitles, but they only appear when the viewer clicks to add them on top of the screen. These are called “closed” captions, and the appearance of your captions looks different depending on the platform. For closed captions, the positioning of the subtitles is unpredictable and might cover an important part of your video. Instead, you can embed the text directly into the video and time it out to appear in step with the video. This is useful for translating your video to a foreign language, transcribing the text directly, or adding labels/commentary that change with the video subject. Some platforms, like Twitter, LinkedIn, and IGTV, don’t have closed caption support, so open captions are necessary for making your videos accessible. In this article, I’ll explain how you can add open captions to your video directly so that they show up any time someone watches it. The Kapwing Subtitle Maker is a free website for adding subtitles permanently and directly to a video. This caption generator – called “open captions” – embeds the text directly into the MP4 so that it looks the same any time someone watches the video. Go to Kapwing’s Subtitle Maker and upload the video you want to add captions to. You can upload a video directly from your phone or computer or paste a link to the video, if it’s already on YouTube, Vimeo, Google Drive, or another website. Kapwing only supports video uploads up to 300 MB or 30 minutes in length. If you have a feature film you want to add subtitles to, you’ll need to download desktop captioning software. With Kapwing, you can manually transcribe your captions or you can use the “Auto-generate” button to get machine-generated captions. Although the automatic subtitles are not perfect, they can save you a lot of time. Listen to the video and, word by word, type out the captions you want to appear. By default, every caption lasts three seconds. You can change the duration of each caption as you go or wait until the end by sliding the start and end times of each title. If your video plays too quickly for you to type, use the -5 second button to catch up. Use the slider to navigate through the video’s timeline and the spacebar to pause and start the video. After you’ve transcribed your video, watch the preview in the left hand panel to make sure the words match the right visuals. You can change the duration of a single caption by dragging it’s start and end sliders or clicking the “Set to current time” button that appears beneath the box. You’re also able to drag the whole caption to change when it will appear without changing the duration. Click the “Set to current time” option to move the start or end time to the current cursor. We recently launched the “Set to current time” and it makes subtitling videos much faster because you don’t need to stop and start the video to set the new start and end time. In the left panel, Kapwing has styling options for your captions. You can add a background and change the font, size, and color of the text. Kapwing is optimized for modern social media formats, so it includes the ability to automatically resize for different social media platforms. You can change the video size to 9:16 for Instagram Stories, 1:1 for LinkedIn, or 4:5 for Facebook. 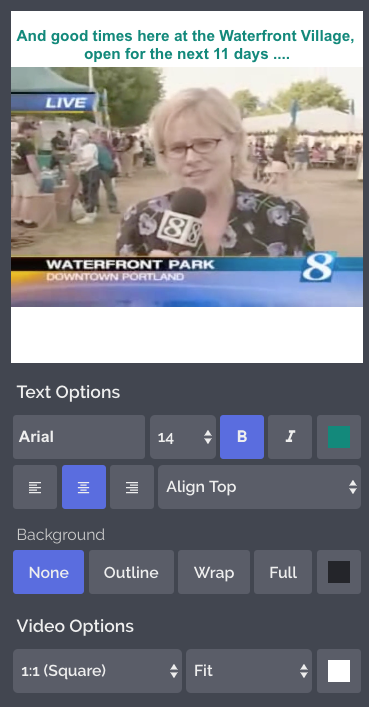 Kapwing adds padding above and below your video to change the video’s aspect ratio. Once your video captions look right, click the pink “CREATE” button to process your video. Wait while the Kapwing Kittens process your video, which shouldn’t take longer than five minutes depending on the length of the video. When your video is done, you can send the URL to your friends so that they can see the subtitled video or download the MP4 directly to publish on social media. Because Kapwing is based in the cloud, you can also edit the subtitles if you notice a typo or want to adjust the styling. Kapwing’s Subtitle Maker is the easiest way to add captions on shorter social media videos. You don’t have to worry about complex file formats or technical encoding. 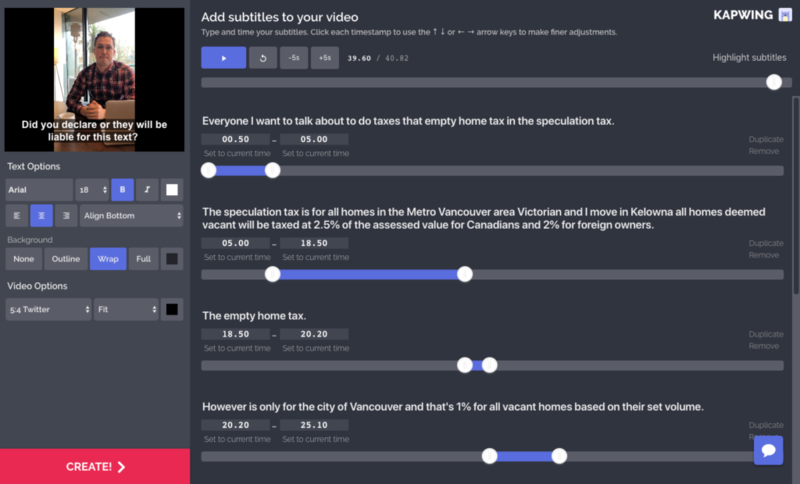 Instead, Kapwing’s intuitive tools make it simple to type and time out the captions directly and immediately see the impact on your video’s engagement. It’s free to use, although there is a small watermark in the corner of the video that you can pay to remove. Several bloggers have reviewed Kapwing’s Subtitle Maker and shown how it works on YouTube. If you have just a few captions, you can use Kapwing’s Creator instead to have more control over the text. Happy subtitling!